Invited speakers: Iordan Avramov (Bulgarian Academy of Sciences), Andreas Blanck (University of Paderborn & Bard College, Berlin), Arianna Borrelli (Technical University Berlin), Florike Egmont (Leiden University), Mordechai Feingold (California Institute of Technology), Raphaele Garrod (University of Cambridge), Gideon Manning (Claremont Graduate University). 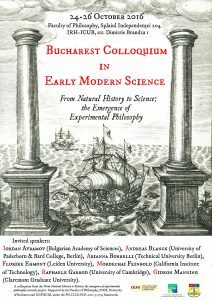 The seventh edition of the Bucharest Colloquium in Early Modern Science brings together an interdisciplinary group of historians and philosophers interested in the interplay between theory and experimental practices in the 16th–18th centuries, with a special focus on the emergence of experimental philosophy. 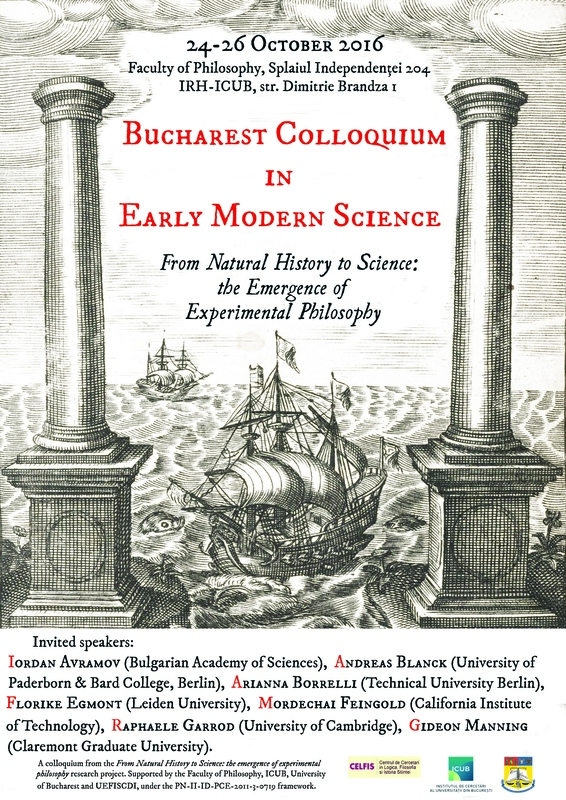 Bucharest Colloquium in Early Modern Science is organized by Dana Jalobeanu and the team of the project From natural history to science: the emergence of experimental philosophy (http://blogs.ub-filosofie.ro/pce/). 18:00-19:00 Keynote lecture: Raphaële Garrod (CRASSH and Newnham College, University of Cambridge), Natural History in Early Modern France: The Poetics of an Epistemic Genre?